The safety of children and water is potentially a controversial issue and I want to make it clear from the start that these are genuine thoughts, with genuine intent but please don’t try and hold me liable for any disasters or accidents that may befall you or your loved ones. I cannot be responsible for your life and any decisions you make on this issue are yours alone. I naturally hope and intend that only good and positive benefit can come from this writing. Children have an almost universal fascination with water, and parents an equally almost universal fear of it, or of their children being near it. We have all heard the horror stories of children drowning in a pond, or even a shallow puddle and our hearts go out to those unfortunate few who have suffered such a fate. But we seem to live in a fear-driven compensation culture, which stifles creativity or adventure because of the risk of hurt. Authorities and companies cannot afford to take risks, or allow other to take them. Consequentially, more and more things get banned in the interests of public safety. The world may be safer as a result but it is certainly blander. As a young child I would walk the suburban mile or so to school on my own, ride my bike to visit friends, play down at the dump, swim in the sea and generally have freedoms many children are not now able to experience. But creative play is an essential part of a child’s development and must be catered for somehow. A love and respect of water should be encouraged and this requires contact and familiarity with it. I believe that those most at risk are those who do not appreciate the dangers and those who are too young to. Out of the disaster of the Iraq war, this burst water main provides a moment of joy for children and adults alike. It is true, of course, that much of this familiarity, or lack of, will be caused by the geography of your environment. If you don’t have water in daily proximity, it is hard to become familiar with it. If you don’t see with your own eyes how a little stream can become a raging torrent after a downpour, then you will not be aware of the potential danger. Knowing the dangers brings about respect, gives us boundaries beyond which we know that things aren’t safe. In urban areas, the increasing use of WSUDs (water sensitive urban design) in the form of swales and rain gardens is a positive development. There’s another good reason for us to have regular contact with water and that is a biophilic one. Water is a vital element, which, through modern living, we now tend to regard as no more than a right of utility. But water is the life force of the planet, and so of ourselves. Why else would we want it in our gardens? It soothes us, distracts us from our cares, puts us in touch with those deeper fundamentals of life, if we but let it. Children who experience this often can only be better off for it. Children playing in a rain garden in their family home. When dry, this is empty. So if I’ve convinced you that it’s good for children to experience water, let’s think about how we might do so with some safety. First of all, young children should be supervised by an adult or responsible elder child, that goes without saying. I don’t advocate that you leave them alone. I don’t know if there are any statistics available as to the ages of children that have accidents with water, but parental sense will tell us all that children under five have little comprehension of danger and must be watched very carefully, as must those of all ages with special needs. Water features should perhaps be fenced off while children are in their early years. If there’s not much you can do about water in your wider environment, then you can perhaps create a feature in your own garden. This drawing of a stream cross-section could also be for a small pond. Pebbles and shingle make a good base, which the children can play with. Shallow water with gentle slopes mean that if they fall over, they can stand up and climb out. Steep sides are the most dangerous aspect of a water feature, preventing children (and animals) from being able to stand up or climb out. Loose paving on the edges of ponds is another risk factor; use only large slabs or stones and make sure that they have only a small percentage of overhang, and are securely cemented in place. Better yet, use a pond-edge design style which doesn’t use paving in this manner at all. A reminder of what it’s all about – fun! Don’t do this on paving which may become slippery and prevent algal build-up. 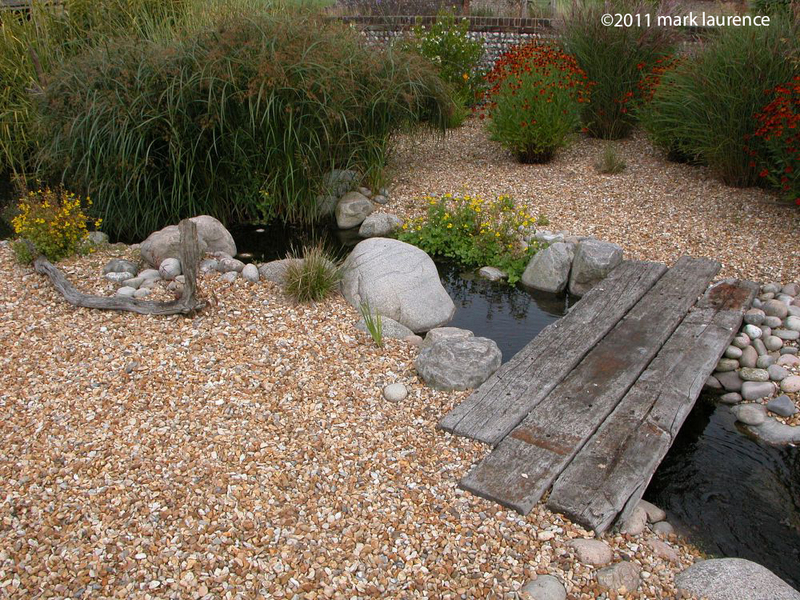 With gently sloping sides, layers of subsoil, gravel or shingle will protect the pond liner and give good grip for feet and hands – bare liner tends to be slippery and is more vulnerable to damage. Good construction helps all round, although that is not the subject of this article. If you have an overhanging deck, make sure the water is not too deep at this point and that children can’t get trapped underneath it. Metal or plastic grids can also be built into a pond, sitting just below the water level. These need careful thought as to their siting as they must take the weight of a person without breaking. The danger is these can look very industrial. 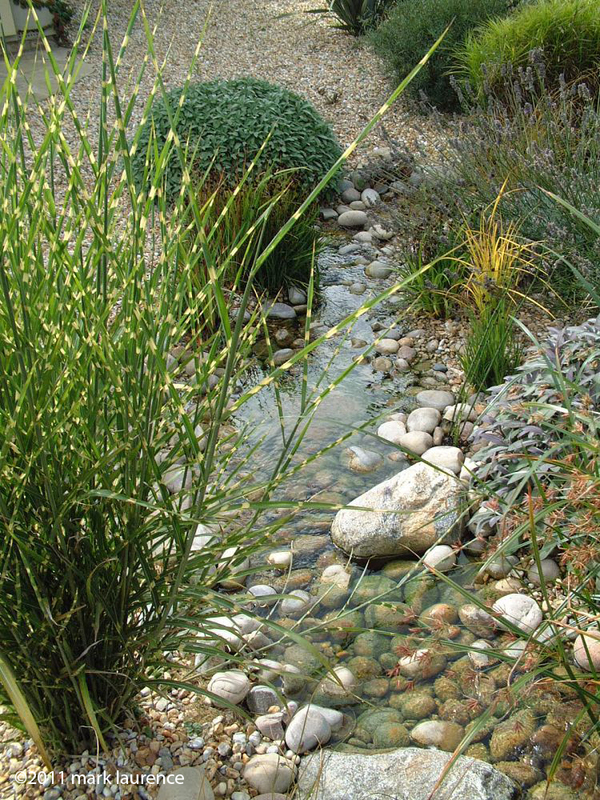 As a final thought, if you want moving water but don’t want the depth of a pond, consider a stream garden, where water just flows along a shallow water-course. There is no pond as such and the water just disappears underground into a hidden sump tank, which houses the pump and which is inaccessible.. In conclusion, there are many things that children learn from playing with water: self confidence, balance, awareness of danger, responsibility, experience of wildlife and of Nature’s rhythms. A careful and reasoned approach is what is required for allow a child safe, creative exploration. And of course, we adults are all children at heart, too. Play safe. The maintenance of ponds is the one thing that people seem to be the most uncertain about – it seems shrouded in myth and confusion. A biological filter can be as simple and as beautiful as this.A biological filter can be as simple and as beautiful as this. Some of this is basic ignorance of simple biological structures but this is enhanced, in my view, by the profession’s over-mechanised solutions to obtaining clear water. There is also a tendency to think that a bottle of some substance can perform miracles and solve unclean water problems – but it can’t. First lets be clear (pun intended) there is a difference between clean and clear water. A pond’s biological functioning might be quite happy with water that is healthy but carries an amount of suspended solids. The health of water is far more dependent upon keeping levels of Nitrites, Nitrates and Ammonia low; these have nothing to do with water clarity. Our aesthetic taste demands clear water, however, and it is certainly true that pure, clean water is always the most beautiful to behold. To obtain and keep clean and clear water, we must keep the pond in balance, so a simple understanding of water balance is useful. This involves two things; mechanical filtration to remove solids, and bacterial action to remove pollutants. A filter box gives some mechanical filtration of solids and creates a home for micro organisms to do their work. It is these bacteria that convert Ammonia into Nitrites then into Nitrates, and they are naturally existing in any aquatic ecosystem. Thus it is not the filter box that does the majority of the work but bacteria already present in the pond. An Ultra Violet filter kills algae, which cause green water. Algae feed on nutrients available in the water – remove the nutrients and you solve the problem at source. This may be an oversimplification, but it is fundamentally true. A UV filter is therefore treating the symptoms, not the cause. I have rarely found a situation where tests have told me anything that my eye has not. That’s not to say that tests do not have their uses but I would suggest that you can observe when a system is out of sorts. Nature is incredibly good at correcting imbalances, given a chance. Ponds are an open system and will always lose water through evaporation, so some new water is always going to be added via the garden hose or a top-up system, preferably from harvested rainfall. Water change regimes are quite unnecessary and probably unhelpful to establishing a balanced system, which has to start again each time this is done. This small rill incorporates a bio-filter alongside the wall. Chutes return water to the rill, having been drawn down through the biofilter. All this adds up to one thing: excessive nutrients in water, leading to algae growth, lack of oxygen, cloudy water – in the end this leads to eutrophication. You have to remember that the average sized garden pond is a mere puddle in Nature’s terms. Ponds of that size would likely be impermanent and support little life, other than in a temporary or cyclical manner. 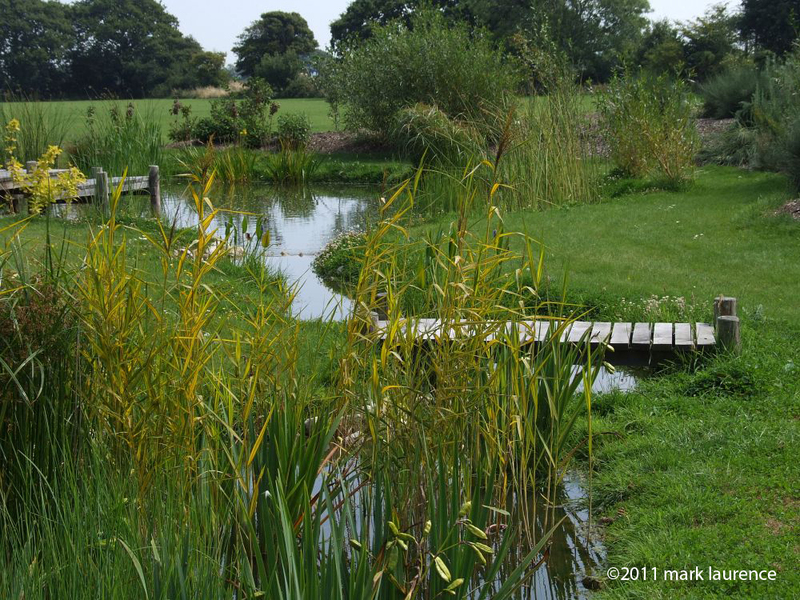 In summer a small pond would dry up unless it were fed by a stream or high water table. If it were fed by a stream, then the pond wouldn’t be a pond – it would be a bulge in the water course. We must accept, then, that the garden pond is a highly artificial environment, which needs some help in order to remain attractive to us, and to its inhabitants. What form should that help take? Where space is severely restricted, a filter box may be the answer, for it crams a lot of bacterial housing into a small space. 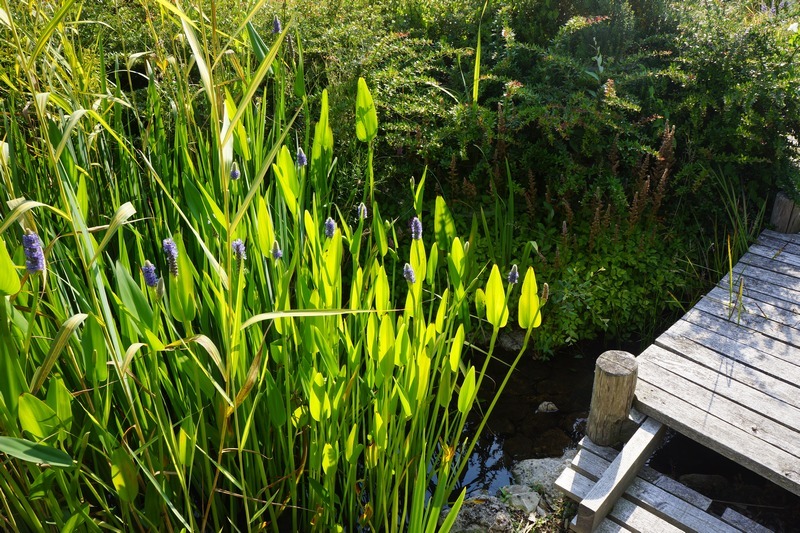 The same can be done, however, by the use of natural biological filtration, which is designed to be an attractive feature of the water garden itself, rather than a utilitarian box than must be hidden. 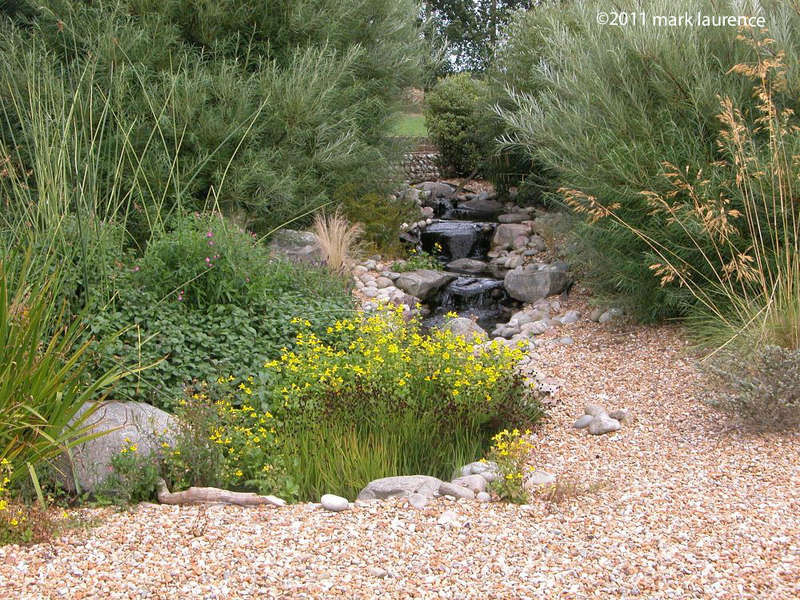 In its simplest form, this can be no more than a gravel filter bed built into a stream which feeds the pond. 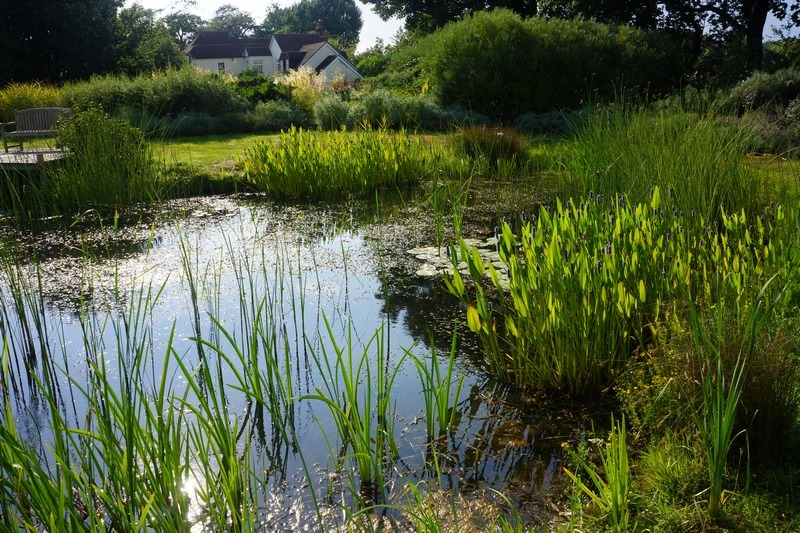 Planted with suitable aquatic plants, this can be a major feature and is also good where hungry fish tend to devour plants placed in the main pond. This filter bed is built into a stream, flowing, right to left, which is pumped from a pond, to which it returns. The filter becomes an integral part of the overall design, forming an important aesthetic feature. How big should such a feature be? Natural filtration is an inexact science, so the bigger, the better. A surface area of one quarter to one third of the pond surface area is a good guide. A more intensive system uses a vertical, rather than horizontal flow. These have a much higher cleansing rate and so can be made smaller, thus saving space. However, they are somewhat more complicated to construct. These operate on a similar principle to the plastic filter box but again, they have a huge aesthetic advantage. I have hardly scratched the surface of this fascinating subject, but the main point is that you are helping Nature to do what she does already, rather than taking control with technology. Water in its purest form is the most simple of compounds – two atoms of hydrogen to one of oxygen – yet it is possibly one of the least understood “elements” on this planet. Strange, when it covers 70% of the globe and our bodies are 70% water. We take it for granted now, when once we considered it sacred. There is little appreciation of water; we no longer walk to the well, there is no effort involved and seemingly no end to its availability – except there is, but that’s not what this article is about. I want to try and inspire a deeper appreciation of this element (not used to describe its chemical properties, for it is, as stated above, a compound), we need to reconnect with it as the source of life and spirit. I’ve worked with water for many years, building ponds and experimenting with biofilters and natural cleansing methods. I work intuitively, not scientifically and am the first to admit to large gaps in my knowledge, with a path of learning ahead of me that still looks impossibly steep! Yet the more you explore the qualities of water, the more you get drawn in: the secret of life itself lies in there. To that end, I have recently gone back to building new water features and greywater systems myself, for there is no substitution for hands-on experience and observation. That water has properties “beyond the obvious” is a no-brainer – you can observe many of these for yourself. Understanding what exactly they are, how they are generated or destroyed, and just how far they go, is another matter altogether. You cannot investigate water for long without coming across the name of “Viktor Schauberger” an Austrian forester who investigated/discovered/rediscovered the more mystical properties of water during the first half of the 20th centaury. So where do we begin, on a journey to a greater understanding of water? That’s difficult, but let’s start with what we can see: the way that water moves. Our mathematical minds tell us that the quickest way from A to B is in a straight line, but water doesn’t move like that, even when it could (in fact, nothing in nature does). Water moves in a never-ending series of spirals and vortices. Why? because that way water is energised; it generates or attracts minute electrical charges and controls it’s temperature, moving as close to the optimum of 4° C, when it is at its most dense (it expands either side of this point). This vortical movement causes the winding motion that we see in rivers once they reach the valley bottoms and plains, and the eddies and swirls you can plainly see in any moving body of water. Vortical movement is centripetal, rather than centrifugal. It uses the force of implosion, rather than explosion. This form of movement gathers force and energy, rather than dissipating it outwards. Straight away this seems odd to us, for we are used to a science and technology based solely on the force of the centrifugal, explosive, dissipative; which inevitably must lead to loss and entropy. That Nature uses a different form of energy seems unreasonable to the scientific mind. It has been said that there is endless energy that can be captured from the movement of water (not from hydro-electric use) and if we could efficiently split water into oxygen and hydrogen by electrolysis then we could capture energy with water as the only emissions; but I do know that the way that water moves is strongly bound up with its health, and so the health of all life, and that is an area that interests me greatly. Schauberger states that water tries to maintain itself at its greatest density of 4°C; then it has greatest energy and the water is at its most “enlivened” state. The problem with this is that it is difficult to measure or assess by conventional scientific means; this does not mean, however, that it is cannot be true. What we can say, however, is that water in its most natural state is the most healthy, and so at its best for both ourselves and the environment. Water may also carries memory, which accounts for whether it is in an “enlivened” state or not. 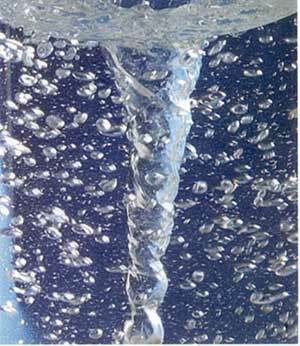 In homeopathy, a benign substance is diluted to the point where it is chemically nonexistent, but potentially very active, and this is based upon the latent memory of water. This is also true of pollutants, whose influence can still be there even once the source has been removed. Fortunately, water will self-heal if only allowed to move in its natural rhythms. The design of Flowforms is one response to this, allowing water to regain it’s own energizing movement, and other devices, such as spiralled copper coils and units containing pre-energised water are all said to effect and energise water that flows past them. I have no particular view about this, but then, I haven’t done any tests on such devises and of course, knowing how to measure potential results is always the problem. In pond ecosystems, health can be largely determined through observation and I prefer this approach, where the results of alteration can be seen in biological response. There are a number of issues I have experimented with at times: enhancing the natural rhythms of water movement, enhancing biological activity in breaking down pollutants, and incorporating ornamental pond systems with purification of household greywater discharge, rainwater harvesting and garden irrigation. All these things require biological understanding and observation but to my mind, they most of all require an open mind and a sense of respect, an acknowledgement that water is in fact precious and scared. I live in an area surrounded by intensive agriculture, which extracts groundwater to irrigate vast monocultures of salad crops. This is the worst kind of abuse of water, treating it as an inexhaustible utility, to pollute with herbicides, insecticides and fertiliser runoff. Mankind’s ignorance and lack of respect for the most fundamental and vital element on this planet can only lead to exhaustion, depletion and pollution on such a scale that the very existence of all life is put under threat. We need to look for the highest potential of life, not the lowest common denominator. Time to get critical in our thinking, and get connected back to deeper understandings. The most exciting thing is that understanding water truly can reveal the secrets of life. Through appreciating this simplest, yet most profound element, I believe that humankind can come to a greater appreciation of himself, and his place in the Universe. All for a cupful of water. I have been lucky enough to have designed and built a lot of water gardens in my time; I’ve been looking back over some of my pictures, and thought I’d share them here. Working with water is like nothing else; it is enigmatic, frustrating, contrary, exciting and absolutely rewarding in a way that few other mediums can be.